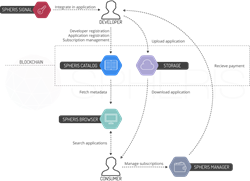 Spheris, the just announced Decentralized Application Marketplace, promises to be the next big thing in the application distribution market. Based on innovative blockchain technologies, Spheris has been designed with a vision to bring an end to the dominance of the centralized and corporation controlled app stores. At first blockchain brought us monetary freedom. Now the time has come to reach development freedom with no censorship and ensure that developers will keep all their profits without being forced to pay middlemen corporations. Spheris is pleased to announce the official launch of their new multi-platform, open source Decentralized Application Marketplace. This innovative platform leverages blockchain technology, with the intention of revolutionizing the idea of application distribution by ending the reign of the centralized app stores controlled by large corporations. With the launch of Spheris, developers will have access to a free and uncensored app store that offers them hundred percent of the revenue as well as complete freedom in terms of development.